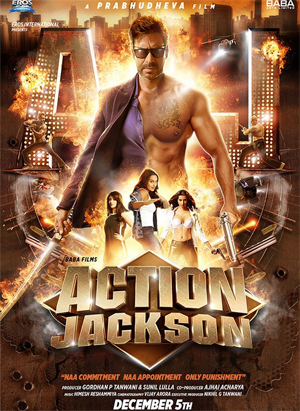 Action Jackson is an upcoming action/comedy starring Ajay Devgn, Sonakshi Sinha, Yami Gautam and Kunal Roy Kapoor in the leading roles. Directed by the great Prabhudeva, the film is scheduled for release on 5 December and promises to be an adrenaline-pumping action caper. The music to the film has been composed by Himesh Reshammiya, with lyrics from Shabbir Ahmed. So does the music to Action Jackson offer us anything interesting? Read on to check out our thoughts on it! To kick start the album, we have Keeda sung by Himesh Reshammiya and Neeti Mohan. The song sounds strange to me and I think this is due to poorly produced music by Himesh, as well as bad lyrics too. It just does not spark your interest in any way and I found it difficult to engage with the song overall. A disappointing effort on Himesh’s part who I feel could have done something better with this song. Next is Punjabi Mast, which has been performed by Himesh, Neeti and Ankit Tiwari. Who are joined by Vineet Singh, Arya Acharya does the rap and Alam Gir Khan. This one is an improvement to the disastrous ‘Keeda’ and I actually enjoyed the heavy use of the dhol drums which really fits in well with the Punjabi theme of the song. In addition, Neeti was also great to listen to and she stands quite well, considering the fact that she is sandwiched in between two major male singers. Give it a whirl and see if you agree with us. Following this is Chichora Piya, which has been performed by Himesh and Shalmali Kholgade. This sounds like an item number to me and instruments such as the harmonium, the drums, as well as Shalmali’s sensuous voice add to the feel of it. Though not an outstanding number, it has still been respectably composed and does have some hook to it. Dhoom Dhaam is next and has been sung by Ankit Tiwari and Palak Muchhal. I would consider this to be my favourite track in the album due to its romantic theme. Both Ankit and Palak sound really great together and the music also helps to give it that smooth texture which it needed. Definitely worth checking out if you’re in the mood for something soppy! Finally we have Gangster Baby, sung by Neeraj Sridhar and Neeti Mohan. I like the rock and roll elements of this song and Neeti’s vocals really stand out here. She gets the notes just right and her voice suits the nicely composed music very well. I think this is another favourite of mine from this album as it makes you want to automatically nod your head along to it. Overall, the songs to Action Jackson are not phenomenal in any way, but still have a number of tuneful numbers that are worth checking out. Himesh has done a respectable job with this one and he includes an array of compositions that I think will appeal to various types of listeners. My favourite songs are definitely ‘Dhoom Dhaam’ and ‘Gangster Baby’ both of which help to give the album some flavour. Let’s hope that the film has even more to offer when it releases on 5 December! 15 queries in 0.368 seconds.